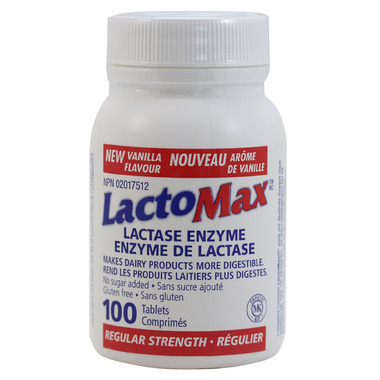 LactoMax Lactase enzyme is for you when you suffer from gas, cramps, bloating, or diarrhea caused by milk or dairy products. Directions: Chew or swallow one to three tablest just before eating or drinking any foods containing lactose. For young children, tablets may be crushed and mixed with first portion of food. LactoMax tablets do not have lasting effect beyond the meal with which they are taken. Active Ingredients: Each LactoMax tablet contains 3000 FCCLU (Food Chemical Lactase Units). Store at room temperature away from heat. I use this product for many years. Good price too. Works perfectly and is a great price! I like it very much. I use it for many years and the price is good. Works just as well as other products for a fraction of the price. This is the favorite flavor and the great product. Love the service, always great and on time. great product!! great price and work as well as the well known brand names. This helps so much! On occasion, I love to indulge in whipped cream, fettuccine alfredo, or even a bowl of cereal, and this makes my life (and stomach) bearable. I've bought two bottles - one for home, and one for work. If you think you might be lactose intolerant, give it a try. I consider myself mildly lactose-intolerant, especially in the morning. Meaning, I can eat cheese and a yogurt cup usually no problem, but I cannot drink a full glass of milk or have cereal with milk without, ahem, bathroom problems. So before I have cereal with milk, I take one tablet. The best part is that you don't have to wait for it to work, take the pill, go and eat/drink. It's great to have an option other than soy/almond/rice milk when it's not available.